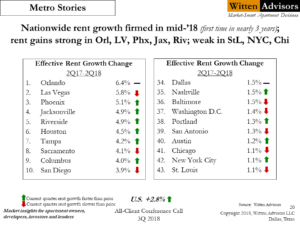 Excerpt from the 3Q18 Witten Advisory: Even with lots of new product, Orlando led the nation in rent growth, with occupancy far above its long-term average…i.e., unusually little vacancy in the existing market. On the other hand, Austin and Nashville had great demand but very little pricing power. The top 10 list on the left features mostly mid-sized markets (with Houston the exception) nicely spread across the country – three in Florida, two in the Inner West, three in California (two of those inland) and Columbus in the Midwest. This quarter we also see more green arrows, meaning rent growth gained momentum from last quarter. This is especially true in the stronger markets on the left but also in some of the more sluggish performers on the right. 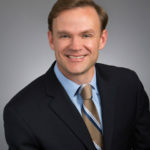 With this renewed momentum, the 2nd quarter of 2018 brought a dose of optimism for the apartment industry.